Ireland’s Conor Swail prevailed over an international starting field to take victory in the $35,000 CSI2* RAM Equestrian Caledon Cup, Phase I, presented by Peel Maryborough, on Saturday, September 21, at the Canadian Show Jumping Tournament held at the Caledon Equestrian Park in Palgrave, ON. Heavy rains diminished the starting field to 22 entries but did nothing to put a damper on the competition. 1976 Olympic individual silver medalist Michel Vaillancourt, who will have the honour of course designing when the Caledon Equestrian Park hosts the equestrian events for the 2015 Pan American Games, did a masterful job of producing 10 clear rounds over his first-round track. Russia’s Ljubov Kochetova also negotiated the first round without jumping penalties riding Wilford 2, but was caught by the clock, incurring one time fault for exceeding the 84-second time allowed. Calgary’s Vanessa Mannix opted not to return for the jump-off with Nirvana de Terlong, automatically giving her tenth place in the final standings. With nine to jump-off, the first four riders all saw their hopes of victory diminish as rails fell. Kochetova riding her second entry, the 13-year-old Danish Warmblood gelding Aslan, was the first to produce a clear round, setting the time to beat at 39.64 seconds. Jonathon Millar, 38, of Perth, ON, was the next rider to leave all the rails in place with Calvin Klein, a nine-year-old Swedish Warmblood gelding owned by Millar Brooke Farm, but a cautious time of 42.78 would leave the pair fourth in the final standings. With only Swail and 10-time Olympian Ian Millar left to go, the stage was set for a dramatic finish. Swail did his part, guiding his 2013 European Championship mount, Lansdowne, home clear in a time of 35.80 seconds. It was all up to the 66-year-old veteran and his 2012 London Olympic mount, Star Power, owned by Team Works. Try as they might, Millar and 12-year-old Dutch-bred gelding couldn’t catch Swail, crossing the timers in 37.49 seconds to place second. The real star of the show, however, was Lansdowne. 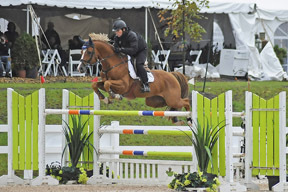 Having first acquired Lansdowne when the horse was seven, Swail campaigns the now 10-year-old chestnut Dutch Warmblood stallion for owners Sue Grange and her daughter, Ariel, of Cheltenham, ON. While Swail competed at the Caledon Equestrian Park in May, winning the $20,000 Adequan Open Welcome with Martha Louise and the $30,000 RAM Equestrian Grand Prix with Game Ready, both owned by the Grange family, the Canadian Show Jumping Tournament marked his first time showing Lansdowne at the venue. The pair are wrapping up a successful summer season which recently saw them represent Ireland at the European Championships in Denmark before traveling to Calgary, AB, two weeks later where they produced a double clear effort for Ireland in the $350,000 BMO Nations’ Cup during the CSIO5* Spruce Meadows “Masters” tournament. While Saturday’s competition acted as Phase 1 of the RAM Equestrian Caledon Cup, Sunday’s second and final phase will determine the overall winner. With defending champion Yann Candele currently in transit to Barcelona, Spain, where he will represent Canada in the Furusiyya FEI Nations’ Cup Final, a new champion will hoist the Caledon Cup in 2013. The CSI2* Canadian Show Jumping Tournament is proud to benefit the Children’s Wish Foundation of Canada. For more information, including full results, please visit www.equiman.com.